In a world struggling to adapt to seismic social and environmental changes, the time is now for businesses to prioritise creating local conditions of peace. 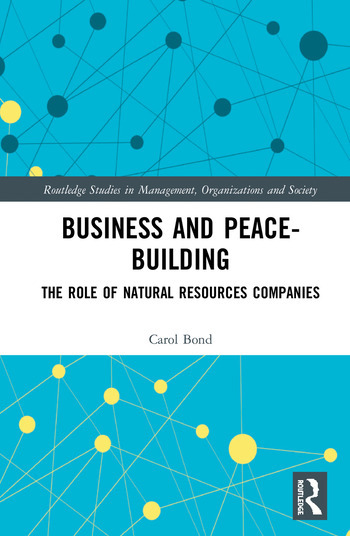 This book builds on original research foregrounding ‘peace’ as a core business outcome for natural resources industries. Especially in non-warlike situations where natural resources industries have exacerbated or caused conflict, foregrounding peace as a core business outcome can bring substantial benefits. Peace is a concept external and internal stakeholders understand. Consequently, research shows that when natural resources sector CSR professionals start reframing their day-to-day decisions in terms of peace outcomes, they are more likely to create efficient and cost-effective solutions to environmental, social and economic business challenges. This book provides both theory and practical suggestions for how to reframe day-to-day CSR activities of natural resources companies as peace-focused, business decisions. Especially in the remote and rural regions of the world where natural resources industries have the greatest impact, businesses can lead the way in contributing to conditions of peace while bringing much needed resources to market. 1. Introduction: Peace or a Pipedream? Part 2: Business and Peace: Paradox or Paradigm Shift? 7. Conclusion: Rhetoric or Reality? Dr Carol Bond is a Lecturer in Management at the University of Queensland Business School, Australia. Dr Bond’s diverse research areas include: business ethics, peacebuilding responsibilities of business, leadership, and Indigenous wisdom traditions. Carol’s research focuses on large footprint industries including mining, coal seam gas, petroleum pipelines and large infrastructure projects.